Town of Maxton | "A Good Place to Live"
Maxton is a town on the move, over the past few years strives have been made to restore the downtown area. The entire downtown area has been placed on the National Register of Historical Places. The “Avenue of Mayors”, a project that placed utility lines underground along Patterson Street and planted trees in memory and honor of former Mayors. 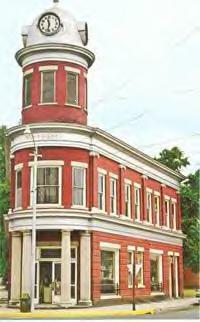 The town offices are housed in the restored Patterson building. The restoration was the brainchild of The Preservation Maxton Foundation, a non-profit organization that raises money to restore and save endangered historical buildings in Maxton. The Town restored the Freight Building, which houses a restaurant with an additional space for rent. This information was provided by Blake Tyner.